Henry Tollof Benrud was born near Cashton, WI, son of Anton and Maria (Dokken) Benrud. He was baptized and confirmed in Immanuel Lutheran Church, and he attended the Woodard school. He worked in the Cashton area until 1916, when he moved to Broderick, Sask. 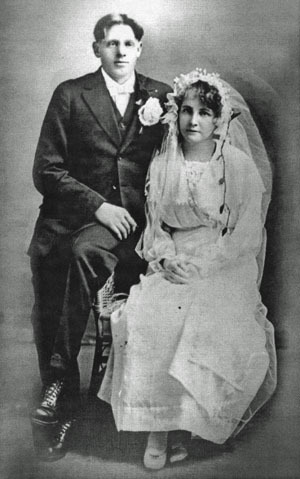 On December 14, 1916, he married Florence Snustead (1895-1985) and until 1937, they farmed in the Haywarden and Strongfield, Sask. areas. He returned to Wisconsin and farmed at La Farge until retiring and moving to Westby, WI. Henry and Florence Benrud had three children: Lloyd; Lyla, Mrs. Virgil Major; and Lillian, Mrs. Eldon Rumppe. They were married 68 years. Henry and Florence Benrud are buried at Sandhill Bethany Lutheran Church Cemetery, La Farge, WI.